T: And we work together. We have a studio practice called Chiaozza, which is our names combined. 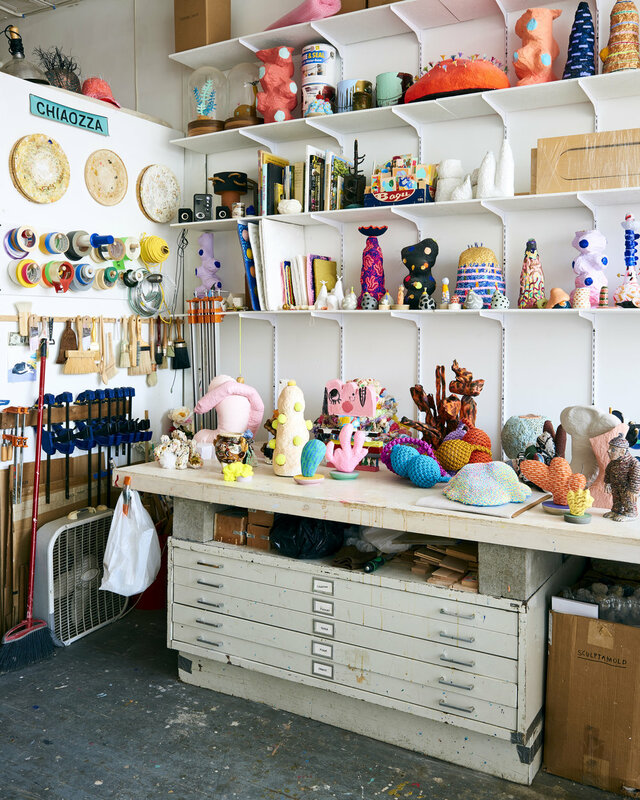 We also work separately as Adam Frezza and Terri Chiao, but collaboratively we make objects, sculptures, paintings, drawings, designs, collages, photographs. A: We like to play together, experiment together and use materials as the balls in the game, so to speak. The materials can be paint, paper, brush, string glue – anything we can guide together to make an image. T: Because we work together on most projects, the work is very much about the dialogue that happens in a collaboration. I think that’s where a lot of the playfulness comes from. What was the impetus behind founding Chiaozza? T: Initially we were actually just interested in being Adam Frezza and Terri Chiao and doing fine artwork shown in an art context like a gallery or community space. But then we oddly started getting some attention from the design community and we felt like some of the things we were making did seem like products. So we started to think that maybe we should have a company name separate from our individual names to give ourselves more free space to further pursue design and product. So that’s where Chiaozza came from. It hasn’t really continued to play out that way because it’s too confusing for people to discern what it means when our names are one way as opposed to another; at this point the names of our individual and collaborative practices have become interchangeable. A: I think that at the beginning it was a way to guide our personal freedoms, where Adam Frezza and Terri Chiao could do whatever they wanted, but Chiaozza had to do more refined, finished and realized things. Like Terri said, since then it’s gotten blurrier and we’ve adopted Chiaozza as a more overarching name for our studio practice. Our social media presence is Chiaozza for instance. But I think that we do still want to hold on to our independence within and without the practice. What do play and craft mean to you? A: A very simple answer is that play means giving ourselves permission to do whatever we want and craft means the editors in us coming out and mediating the making process. But play and craft are in a constant flux in our practice. The play might be very structured and rigid, where we set up a game for ourselves and have an actual back and forth, or it might be very loose, where anything goes. The same goes for craft. For some projects the craft might be very strict and focused; it might require a certain finish. For other projects we might allow ourselves to get really messy to keep ourselves in check; through experimentation we’ll allow clumps, lumps and hairs to show up in things. T: Right. And whim in some ways is important in play – letting yourself just try something that you’ve been thinking about without necessarily knowing where it’s going to go. I think that the play aspect also comes from us being partners in life and just wanting to have fun. A lot of the practice has grown out of us being playful partners at home and doing experiments like moving our furniture around or messing with food. For example one of our first projects, Pancake Prints, was born as we were sitting around having pancakes for breakfast and had the idea to roll ink on them to make prints. I think Adam mentioned the notion of permission before, and I think that sometimes play is about giving each other permission to actually follow through with those silly ideas, which have often led to other things that are much more rigorous, big, thoughtful or considered. A: And in the midst of a big project it can be helpful to remind ourselves that the origin of the project was play; when it gets stressful or deadlines approach or things pile up, it kind of calms things down and puts things into perspective. We have to remind ourselves that it’s all part of the game. A: It’s light. Pretty bright. There’s always something to play with, whether it be a mess in a corner to clean up or piles of scraps from different projects. We keep around things that inspire us and egg us on, like mementos from walks. We surround ourselves with those visual tools, as well as with physical tools and materials. But our studio is our biggest tool. T: When we first started working together we were doing experiments around the house, mostly in the kitchen because there is a big table there. I think that the impetus for even getting the studio was that we wanted a place where we could work on something and then leave it and come back to it without feeling like it was cluttering up the house or taking space. The studio makes space for us to play more seriously. We lucked out in that we were able to find a studio that is very close to our house. It feels a bit like an extension of our home in some ways; it’s just two blocks away so we can go back and forth several times in a day if we have to. But I do think that the studio itself has grown into something more; it is this comfortable space that’s like another part of your brain or your body… I’m not sure what you would call it. T: Yeah, kind of like a laboratory. T: It depends on the project. A: Yeah. I could say everything from being alone on a remote island with no deadline to having a deadline-oriented project where we make a proposal, it’s approved and it needs to be completed by a certain time. That kind of structure can really force a project to happen. At the end of a project like that we’ll look back and realize that if we hadn’t had a deadline we probably would never have finished it. But then sometimes we go on a residency with no goal and just do what comes to us – that’s actually where a lot of ideas gestate and form and grow. So a balance and dance between freedom and deadlines is optimal for us. A: Cleaning the studio and our house. Shaking it up, rearranging, organizing our tools and materials in a way that suits our bodies and the rhythm of our practice at the time. I think that’s crucial. T: Right. Cleaning does feel like a ritual because it often comes after a period of extreme deadlines or work where we’re getting a bit sloppy with putting things back where they go. After times like that we have to retract and clean everything, set everything up again and maybe even change the way things are so that they’re better suited for the next project. That can often take days and we’ll stay up late doing it. Another ritual is that we like to sleep until we wake up naturally and then take time to eat breakfast. I feel like that’s really important. We usually don’t like jumping out of bed and starting work without a transition, though sometimes it happens. A: Both of those things require another kind of permission. We allow ourselves the time to not make something because we have to clean or reset the studio. And there can be an element of stress in that moment of allowance, but we have enough trust in each other and in ourselves that we are going to work better and more clearly once we do. Breakfast is a big part of that too. Allowing ourselves to sit down for an hour long breakfast, which we recognize is a luxury, is a huge tool; it gears us up and gives us a lot of energy to go about doing the things we do. What is the role of natural and synthetic materials in your work? T: I think that we see both of them as equal inspirations. We might agree that the spectrum of natural versus artificial is continuous. Nature is really a construction of the human mind in a way, maybe designed as a way to separate ourselves as humans from the natural world. But in reality we are a part of it. So a lot of the things that we’re attracted to come from the ‘man made’ or ‘utilitarian’ world versus the ‘natural’ world. So they’re two descriptors that we use but they often flow into each other. A: It’s like this sliding scale where there are two optimum points or concepts that don’t actually exist, but everything within the scale does exists. We’re constantly riding along that line and grabbing from anywhere we can, plucking a beautiful color or a curious shape and using it as inspiration. So walking through the hardware store might be just as inspiring as walking on a trail through the woods. T: Yeah. I think that one interesting example is the idea of the garden. We love going to botanical gardens whenever we have the chance. When you’re in a garden and you’re looking at ‘natural’ things, you’re experiencing the ‘natural world’, but in reality the garden is totally a construct of humans. Humans have decided to put these plants here, or let them be here if they already were, and sometimes they even shape the plants a certain way for a viewer’s experience. We think about our work like that; we shape material that already exists into something we see or something that we want to see. So I think that the natural and the utilitarian are not binary and that’s directly related to our working process. Why are some of your projects labeled as ongoing? A: It either means that there’s an aspect of the work that maybe we don’t feel like we’ve fully realized or that we’re excited about a project and don’t want to stop doing it. Sometimes it feels like we’ve only just tickled an idea and we want to keep it alive. Like I often don’t finish books; I’ll read 90% of a book and leave the last bit so that I don’t get let down or spoiled. Then the book echoes. I think that it’s a way to keep the projects echoing. How does community play a role in your practice? T: It’s really important to us. We get to talk a lot about our work with one another, but I think that in sharing our work with other people we often learn more about it. Even just having to talk about a project to someone who has no foundation for what I am describing helps me to contextualize things a little bit. I also feel lucky that we’re in a place where there are a lot of really awesome people around doing very good things and succeeding. It’s nice to be in the kind of environment in which your peers care about what you’re doing and you care about what they’re doing. Both Adam and I went to grad school, so there are bits of those communities still around us. That’s really nice because those are people that you’ve almost grown up with as a professional person, so there’s a bit more history there. There’s also community that we’ve built outside of New York through residencies, which is awesome. Though I think that when we’re in those other places we’re reminded of how lucky we are to be connected to such a strong community here in New York. A: I think that we consciously take on projects that engage us beyond our independent practice. Taking a job with, say, Opening Ceremony, expands our community beyond what we would otherwise access, giving us exposure to this sort of whimsical realm of high fashion. To have a dialogue with that world and to kind of inject ourselves into that conversation is an interesting and wonderful challenge. On the other hand, we have collaborated with a group called Biome Arts to create a little greenhouse theater. This artist Mary Mattingly has a floating farm that has floated around different harbors in the city, and the theater was conceived of as an educational hub and safe space for performance around the farm. To engage in a community like that counterpoints and expands something like Opening Ceremony. I think that ultimately connecting with people within any community who are passionate and engaged reaffirms our drive. If we can see that people care about something, we want to put as much effort in as we can. I think that’s contagious. In what ways has your collaborative practice evolved since founding Chiaozza? T: Well we’ve taken on bigger projects – the Coachella project being a prime and recent example. I think that a lot of times we start small because we’re just testing an idea, and through documentation we’ll put it on our website or elsewhere online. Sometimes someone will see it, maybe years later, and they’ll come to us and ask if we would do something like it but bigger or for a particular purpose. That’s something that has been happening more and more the longer we’ve had our practice; the documents or small physical objects get dispersed, people see the potential for something else, and then we get an opportunity to expand that project both size-wise and conceptually. That’s pretty cool and that’s something that takes time and is a constant effort. A: And maybe our understanding of each other. We basically started collaborating when we met. Since then, we’ve been learning to let go of whatever individual practice we might have dreamt of pursuing. There is a certain generosity of spirit and of sharing ideas that I think continues to blossom and grow and refine itself. We can now very easily gift each other, and ourselves, our ideas. That feels like a very important part of collaboration. I’m grateful for that aspect. T: Yeah, the shedding of the ego and the welcoming of the collaborative spirit. T: The challenge is honestly just managing our time, because there are so many different things happening at once. It’s a constant challenge just to keep the flow going and to figure out how and when we are going to do things. We are constantly having to regroup and make calendars and lists to map out exactly what we’re going to be working on for the next two weeks. Then I think there are also the practicalities of maintaining the studio and paying rent, making sure that we can continue to do the things we want to do. So making the time and space may be our greatest challenge. I feel like the ease is that we have a lot of ideas. There’s always something we want to do that we have not done yet. A: Right. When the lulls come and there aren’t a lot of things to keep track of, that’s when the ease gets to work itself in. We get to sit alone and do whatever we want and another idea might come from that. Maybe it’s great, maybe it’s not, but we don’t put the pressure on it to critique or edit – just do. To be able to allow ourselves to do that makes everything worth it. I keep thinking about challenge and I think that email, and other admin stuff, is a part of that. We don’t always respond to every single email in a timely fashion because when we write an email we try to put as much of ourselves into it, and that takes time. We definitely go through phases of being indifferent or beating ourselves up about not responding, but we remind ourselves that it’s better late than never. So even if there’s an unread email that we find in our inbox six months later, we still like to try and say something, even if they hate us. A: Joy, playfulness, curiosity and bewilderment. We don’t shy away from the ugly just as we don’t shy away from the cute; we dance with the two. T: It’s really nice when we can make something that invites an immediate feeling or that incites an almost primitive experience. We don’t engage too much in the overly heady conceptual stuff, because I feel like it distances from the way we want to make things right now. Even though the conceptual stuff is there sometimes, I feel like the physical experience or reaction to the work is important. We also really like when people feel empowered to do something themselves. We’ve gotten several emails from elementary school teachers who have shown our work to their classrooms and have done paper plant art. We get excited about the fact that someone was so into the work that they wanted to take it as a jumping off point to do something of their own. I think that’s really positive. A: If we can inspire someone to create something we’d never shut that down. A lot of our practice is about encouraging creative flow and giving. If the object is a gift and it can continue that role by manifesting itself through someone else’s hand, that’s brilliant. A: Sure, there’s that. I mean there’s so much. T: I think it’s a tough question because inspiration comes from everything and nothing. The tiniest experience that you may not think anything of might stick with you. We sometimes talk about this picture of a turkey sandwich that we once saw in a magazine. It was photographed in such a way that the colors looked so beautiful. A: The little blob of mayonnaise was apart from the sandwich and maybe there were some wine stains on the table cloth. It was in a spread of a photographer’s work. We always beat ourselves up that we didn’t buy it, but I think that it was for the best because in our memory we’ve built up this mythological image. If we were to revisit it we probably wouldn’t have the same response. I think that a lot of inspiration works that way; it’s in the moment and it’s very special and fleeting. You could revisit the exact same thing but you might not get the same texture or substance from it. You might say that we are like bees who buzz around and are not enamoured by one flower but choose from many. T: I think that that’s a good way to think about it; as ephemeral moments. We talk about going for walks and spending time in forests or national parks – when you’re immersed in the landscape it’s concrete but what you take away is a memory of it. I think that’s a constant inspiration for us, thinking about the feeling, the memory, of being in a boulder field or in a forest or in a canyon or sitting under a tree. A: If we ever copy nature we generally fail, but if we use it as a starting point it leads to something more unique in the end. When I was in school I worked through art historical heroes like Miro and Paul Klee and aspired to be a figure of a similar sort. That prospect can be really enticing, but I think that it’s important to work through those heroes to find yourself on the other side. It’s the difference between inspiration and reiteration. Reiterating something is not always inspired; it’s more of an exercise or copy. How have you learned what you know? Did you have any teachers or mentors who helped shape you as artists? A: The first guy that stands out is Arnold Mesches. He was a painter and an instructor at the University of Florida where I went to grad school. He recently passed away – in his mid nineties – and was painting all the way up to the end of his life. I would say that more than any image he ever made, this man’s humility, passion and drive throughout his career carries something in our path. T: I think that a lot of learning has also come from just doing and observing. Yes, school was great and there were endless mentors and assignments and fellow students there, but I also think that being in the world and learning in the moment has been just as important. A: Patience is an endless lesson. We have to be patient to learn patience and we have to keep doing it over and over and over because it’s not automatic. It’s always surprising when you think that you’ve learned patience already and then another challenge will arise and you realize that you’re not automatically patient. I think that’s a beautiful lesson to continue to learn in life. Ultimately we’re all heading towards the ground, so to live life in the moment allows us to experience it more fully. T: Patience is the biggest one and it echoes in a lot of different ways. Even taking the time to do something properly is something that I constantly struggle with. A: Well, I think that after saying yes we can more easily say no. Saying no right off the bat leaves the question of Could that have been? So it’s saying yes to the stupid ideas right off the bat, trying them out and giving them a chance, and then saying no. A: In our practice we use our hands a ton. I think that it has made my hands very strong. I feel able and capable. For a while I was drawing very intricate drawings and I could feel the tightness of focus that was required to get certain lines. I didn’t want that future for my hands. I think that working in clay and different sculptural substances feels more therapeutic, like a massage for the hands. It does feel like a decision about material and a consideration of what is going to be the most enjoyable on our bodies to fulfill a certain project. T: We think about that a lot. For instance with the wood projects we used hand tools and pull saws as opposed to machines. It was a conscious decision because those tools feel more harmonious and enjoyable. They allow us to be a little more connected to the material, and even though the result isn’t as perfect as a machine, we welcome it. Adam Frezza and Terri Chiao in Brooklyn, New York on May 12, 2017. Photographs by William Jess Laird.